Now, I knew that she had been shopping on-line, but I didn't know that it was for a new spouse!!! Some of the fraudulent charges were from Match.com and Yahoo! Personals! I called my bank, and they were fantastic! The person who used the card apparently used it as a credit card – they did not know my pin code. They immediately put a hold on the VISA check card and sent a new one to me. They have already reversed the charges and credited them back to my account. So, I am now officially a fraud victim. 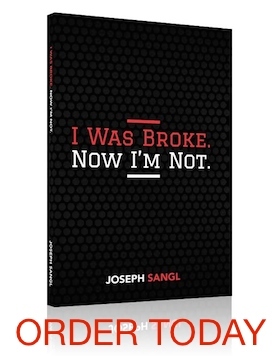 It makes me wonder how many www.JosephSangl.com readers have been a victim or know someone who has been a victim of this type of theft! SUBSCRIBE to receive posts FREE via E-MAIL! We were out to dinner and paid with a VISA bank card. The next day we went for gas or something and had insufficient funds. There was an exorbitant charge for a cell phone bill that had been paid online with our number. We were afraid the waitress or someone in the restaurant had picked off the number (it can happen). We got new cards and filed paperwork at the bank. Apparently, when all was said and done, it was a typo in someone’s effort to pay a bill online or over the phone. Keep an eye on the bank statements! ps-I also had a person type in $300 something rather than $30 something at an oil change place…BIG DIFFERENCE! My mom had an issue where someone with the exact same name whose social security number was the same with only 2 digits transversed died and when the credit bureaus entered the information they transposed the numbers in the social, making it my mom’s. She had to fight it for years with all 3 credit bureaus. She was so frustrated! Joe, now that this has happened, you can freeze your credit files with all three bureaus for FREE!!! I am a victim of credit card fraud! The stealers started off with a $1 charge, then a $30 charge and finally a $70 charge. Since it was a website that I had never used before, my credit card company caught it and called me to see if it was me. I told them it wasn’t. They cancelled my card immediately and denied all future charges to my account. They also reimbursed me the money that was inaccurately charged to my account. Luckily, I no longer use my credit card because I’m becoming debt free, but it was a scary experience!! The Bank (of America) caught the activity (online purchases, including airplane tickets) & put a hold on my card until I showed up at their office in person and confirmed my identity with 2 photo ID’s. My bite was over $2000. The bank never refunded a dime- they don’t have to; they don’t want to. Just a couple months ago I had someone get ahold of my card number and duplicate a fake debit card. Then they went on a shopping spree at three different Drug Stores and Grocery Stores… they were only able to spend about $400 before my bank (wamu) caught it and called me. I’m in the middle of the investigation process right now, but they’ve credited my account for the amount of the fraudulent charges for now. I have no idea how they duplicated my car, but I guess you can never be too careful! My mom had a some one take her checking account infomation. While her account is with Charter one, they were writing check with a wells fargo logo on them for a business in AZ (though she lives in MI). One more thing, can you tell banks to only use your bank card as a debit? At sometime can you discuss the difference (for both the consumer and the business) between using a debit card linked to a checking account and using the same card as a credit card. I hope this makes sense. . . I had three yearly subscription fees for World of Warcraft ! Same thing happened to me, two charges for match.com. Believe it or not, its not online shopping etc, it happens when you eat out and you pay the waiter using your check card!! they copy the number, go home, and enter it on match.com, they know they are going to get caught but all they want it to be able to communicate w. other members (exchange email etc) since they know the account will be closed. They can also create accounts all day long. I actually called match.com and had them cancel the users account but they would not give me additional information due to privacy bs. laws. Match.com actually was the one that credited my account. Hi guys and gals ! How are you ? I am new here, pleaze welcome me.